We offer Granule Machines ideal for packing of granule such as sugar, rice and pulses etc. Automatic granule packaging machine adopts PLC control bag length regulation and adjustable volumetric cups for measurement. It is suitable for heat sealable compound materials such as single Paper/PE, Cellophane/PE, Aluminum foil /PE, BOPP/PE, Nylon/PE etc. Easy to operate, energy efficient and cost effective, the vacuum packing machines offered by us are available in different models diverse applications. 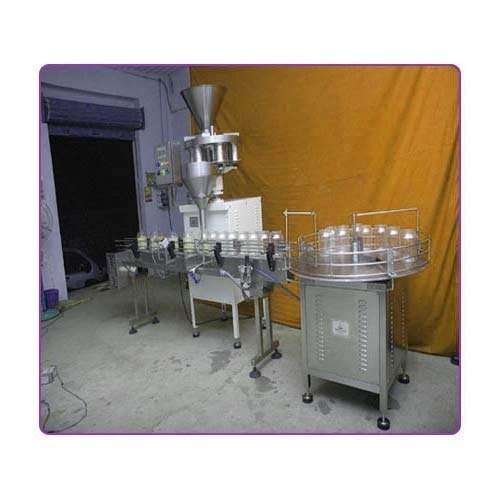 We have gained a remarkable position in the industry by offering a quality assured range of Granule Filling Machine, widely use in various industries. We offer the entire machine in various configurations as per varied requirements of our clients. While manufacturing the offered range, we lay special emphasis on its efficient functionality. The offered machine is broadly demanded in the market, owing to its long operational life and fuel efficiency. 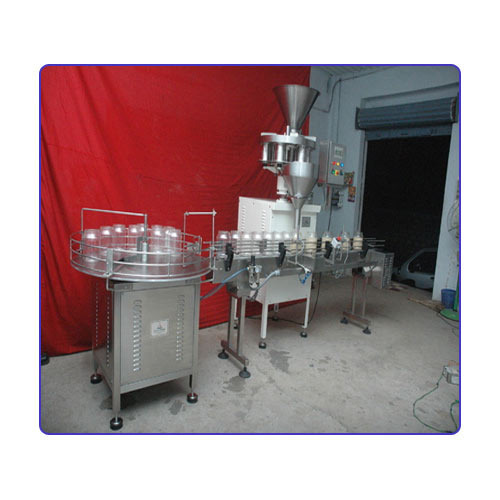 Jar Filling Machine for All kinds of fill free flowing Granules like food grains, pulses, seeds, salt ,sugar ,Tea, pesticides and chemicals, etc. 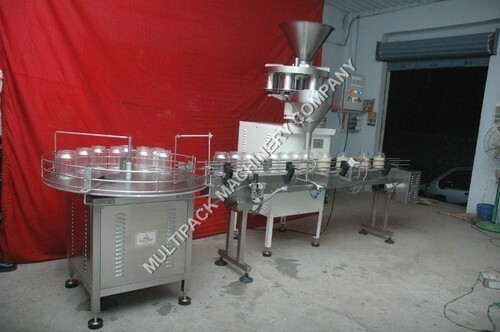 Jar Filling machine for any kind pe Pet / HDPE / Glass Bottle and filling range from 10gm to 5 kg . Also Our machine operation shall be tube feeding tube filling tube sealing and tube coding(mfg, date, Expire, Lot No etc) Single operation with indexing we manufacturer Auto and semi auto Paste tube filling machine. Input (container dia. And height) 24 mm TO 50 mm Ø / 75 mm Max. Net weight 300 Kgs. Max. One of the pioneer in the packaging industry, For-bro offers manufacture, export and supply a complete range of Volumetric Cup Fillers in standard and customizable models in Mumbai, Maharashtra, India. For-Bro introduced double discharge mechanism in Indian salt industry and revolutionized the salt packing industry with very high speed low maintenance. No. of Sealing Head 4 Nos. 6 Nos. 8 Nos. 1 HP / 415Volts / 50 Hz. 1.5 HP / 415Volts / 50 Hz. 0.5 HP / 415 Volts / 50 Hz. Height of Conveyor** 860 mm to 910 mm Adjustable. we are involved in manufacturing, exporting and supplying the wide range of High Speed Powder Packaging Machine . 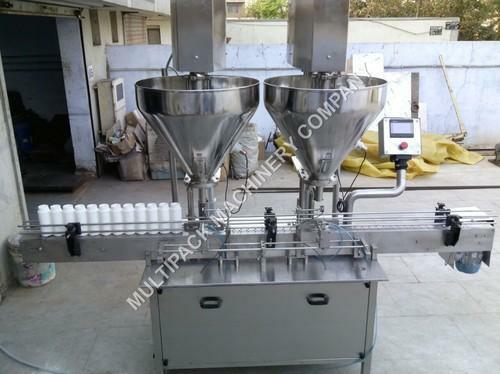 This machine is majorly used in packaging industry for packing various powder products at high speed. Under the proper guidance of specialized professionals, offered packaging machine is efficiently manufactured. Direction Left To Right. Left To Right. Production Rate Up to 30 to 40 Bottles / Min Up to 60 to 80 Bottles / Min. Fill Capacity 10 grms to 50 grms. (with different set of Auger and funnel) Fill range depending upon Bottle opening and bulk density of powder. 10 grms to 50 grms. (with different set of Auger and funnel) Fill range depending upon Bottle opening and bulk density of powder. Electrical Supply 1.00 HP For Main Drive. 0.25 HP for conveyor 2.00 HP For Main Drive. Power Requirement 440 Volts, 3 Phase (4 wire System) 50 Hz. 440 Volts, 3 Phase (4 wire System) 50 Hz. Bottle Diameter 25 mmTo 70 mm MAX. 25 mm To 70 mm MAX. Height 55 mm To 110 mm. 55 mm To 110 mm. We are successfully emerged in offering a qualitative assortment of Jar Granule Filling Machine. Our offered machine is precisely manufactured at our ultra-modern manufacturing unit using high-grade components and advanced technology. Apart from this, we stringently test the entire range upon numerous parameters enduring its flawlessness. This filling machine is made available in various technical specifications at reasonable prices. We are instrumental in providing to our valuable customers excellent quality Rice Batter Filling Machine which is available with following specification:- Model No : IP-LFM -20 (SS-304) Filling Heads : 1 Heads Operating System : PLC integrated MMl screen controlled system with production counter attachment for multiple filling. Looking for “Granule filling machine”?